Kim Jong Un Considering Whether To Resume Nuclear Tests Pyongyang blamed U.S. officials for the breakdown in talks in Hanoi last month and said North Korean leader Kim Jong Un will soon decide whether to end his country's voluntary moratorium on testing. 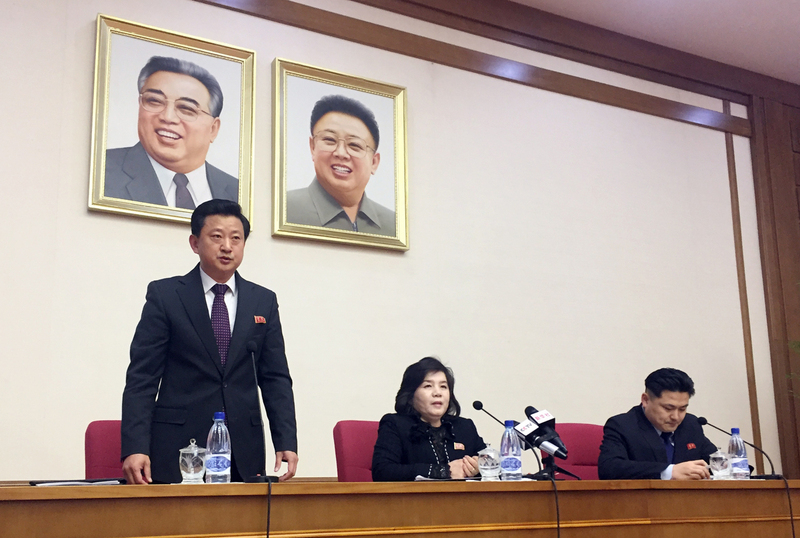 North Korean Vice Foreign Minister Choe Son Hui, center, speaks at a gathering for diplomats in Pyongyang, North Korea, on Friday. North Korea is considering breaking off negotiations with the U.S. and resuming nuclear and missile tests, following last month's summit in Vietnam that ended early and without an agreement, a government official said. Vice Foreign Minister Choe Son Hui told diplomats and reporters in Pyongyang on Friday that North Korea was disappointed with the outcome of negotiations between President Trump and Kim Jong Un, and that Kim would soon decide whether to end his country's voluntary moratorium on testing missiles and nuclear weapons. "We have no intention to yield to the U.S. demands [made at the summit in Hanoi] in any form, nor are we willing to engage in negotiations of this kind," Russia's TASS News Agency quoted Choe as saying. She blamed the U.S. for the stalemate at the Trump-Kim summit in February, saying Secretary of State Mike Pompeo and National Security Adviser John Bolton "created the atmosphere of hostility and mistrust," TASS reports. In a briefing with reporters on Friday, Pompeo rebutted that claim. He also played down Choe's remarks on ending the moratorium on weapons testing. "In Hanoi, on multiple occasions, [Kim] spoke directly to the president and made a commitment that he would not resume nuclear testing, nor would he resume missile testing," Pompeo said. "That's Chairman Kim's word. We have every expectation he will live up to that commitment." Choe did not issue direct criticism of Trump and told reporters that "personal relations between the two supreme leaders are still good and the chemistry is mysteriously wonderful," South Korea's Yonhap News Agency reports. Her remarks come as both countries have refused to budge from the diplomatic positions that set them at odds in Hanoi, and as satellite images show that North Korea has rebuilt a satellite launch facility and resumed activity at a site used to assemble intercontinental ballistic missiles and satellite-launching rockets. At the summit on Feb. 27 and 28, North Korea asked for relief from five major U.N. sanctions and offered to dismantle a major nuclear weapons research site at Yongbyon, but the Trump administration insisted that North Korea surrender its entire nuclear program in exchange for economic benefits. The U.S. line appears to have hardened since then, NPR's Anthony Kuhn reports from Seoul, South Korea. Speaking at a conference on Monday, U.S. Special Envoy on North Korea Stephen Biegun said the administration was clear and unified in its position. "We are not going to do denuclearization incrementally," Biegun said. Kim Joon-hyung, a political scientist at Handong Global University in Pohang, South Korea, tells NPR that Choe's remarks on Friday appear to be a bargaining tactic. "Right now, I think they're really frustrated," he says. "They're digesting, and preparing their next step. They want to double-check what's inside of Trump's mind." As NPR's Geoff Brumfiel has reported, recent commercial satellite imagery of North Korean sites suggest the country might be preparing to launch a missile or a satellite-bearing rocket. Images of a site known as Sanumdong, taken by the companies DigitalGlobe and Planet, show vehicles, rail cars and cranes at and around the facility used to assemble missiles and rockets. Brumfiel adds: "News of the activity comes just days after other satellite imagery showed that North Korea has rapidly rebuilt a satellite launch facility on the country's west coast. Known as the Sohae Satellite Launching Station, the site has been used for several attempted space launches over the years, most recently in 2016." North Korea began disassembling Sohae last year after the first U.S.-North Korea summit, in Singapore, but work stalled several months later. Recent satellite imagery shows that construction to rebuild the site began between Feb. 20 and March 2. Joseph S. Bermudez Jr., a senior fellow for imagery analysis at the Center for Strategic and International Studies, told Brumfiel that the construction at Sohae likely took place after the Hanoi summit ended, given the site had previously laid dormant for months.